When I met my husband he lived in Wyoming and I lived in Massachusetts. It was 6 weeks before Valentine’s day. Weeks went by, hours were logged on the phone and as things progressed I told him he wasn’t allowed under any circumstances to send me flowers. You see, I was going to be buried in gorgeous blooms ordered by some discerning men for their lady loves in Boston and I knew anything he might be able order online would’t make my heart flutter. He’s a smart guy and sent me a box of the most incredible hand crafted chocolates from the very best little sweet shop in Sheridan, WY - The Chocolate Tree. But sometimes a girl just needs flowers for her own table that aren’t leftovers or the stems that didn’t make the cut for a wedding. There are days I want to try a new product, or visit with an old favorite. A few times a year I add a bunch or two of beauties to an order to enjoy - just for me. 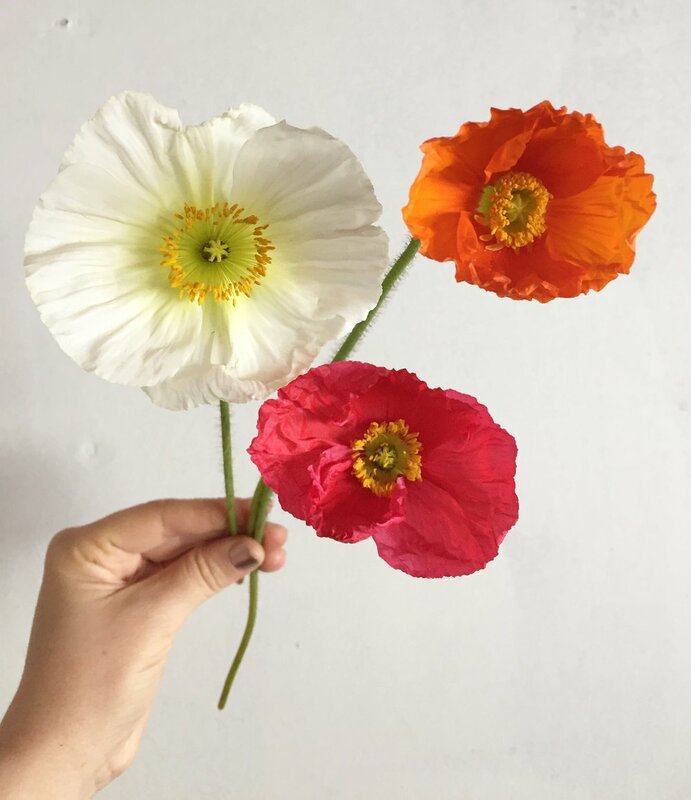 Poppies are a family favorite and we’ve got a big wild patch of deep orange oriental poppies in our front yard. For two glorious weeks they are a riot of color and people stop while driving/walking by to admire. I don’t often use them in design work but sometimes they are irresistible.